Sportsmans Warehouse is one of Australia’s leading sports stores and now you can buy their online gift vouchers via Prezzee. A Prezzee eGift Card means you can purchase a gift voucher for $50, $100 or $150 for your recipient to spend at any of their stores or redeem online. These great looking eGift cards can help solve the "what to buy" dilemma for any gift-giving occasion whether it be a Birthday, Christmas or just to say thanks to someone or any other occasion. This gives your giftee the flexibility to purchase exactly what they want and doesn’t leave you guessing what colour, size or style of gift to buy for your niece, nephew, daughter, son, cousin, partner, friend or colleague. Sportsmans Warehouse gives the opportunity to help someone chase the feeling! A Prezzee Sportsman Warehouse present offers a huge range of branded products and information to inspire sporting and fitness endeavors in an easy, one-stop, and well laid-out shopping environment with the purpose of helping you feel good through physical activity. Sportsmans Warehouse is all about fostering fitness, no matter what the activity there stock items to help fulfill the leisure activity your giftee is passionate about. 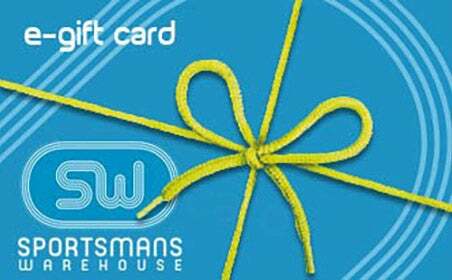 Why not give a gift that always fits – A Sportsmans Warehouse E-Gift Card! With Prezzee, you can simply choose an awesome Gift Card from Sportsmans Warehouse with ease. Our Cards are fast, easy to use and can be redeemed online or anyone of our physical stores. With a 3 year expiry to use the card, there will be plenty of time to pick a present, but we know they will want to jump online or come in to store pretty much straight away to see what's in store at Sportsmans Warehouse!